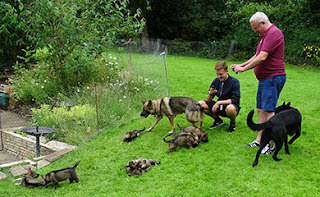 It has been a very busy 2 weeks culminating with the pups leaving on Tuesday 19th July to go to their new puppy walking families and new homes. 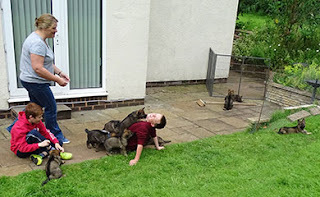 They were 8 weeks old and needed to be parted as the play fights were getting much too rough. I had been taking them out on visits to keep them occupied. 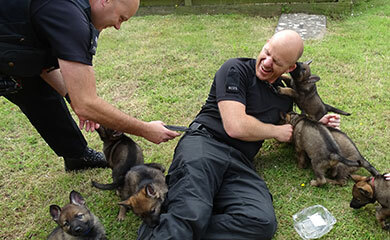 They are pictured here visiting the dog school roughing up the staff. 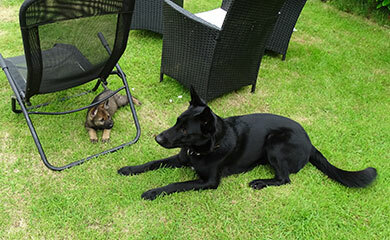 Lenny and Sasha have been brilliant from start to finish watching over them and keeping order. Lenny has been particularly gentle always watching where he steps and not being too rough on tug games. Watching how gentle and tolerant he is of the pups you could be forgiven for thinking he is too soft for a Potential Police dog. 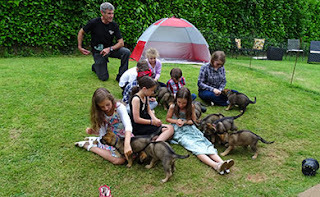 But you would be wrong it is called good character which he has in abundance. 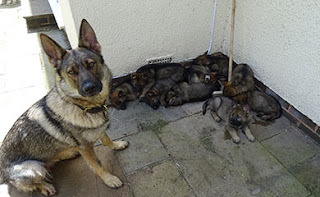 My favourite video is him stealing a sock from one of the pups and allowing the persistent pup to steal it back. 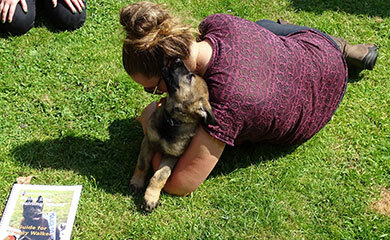 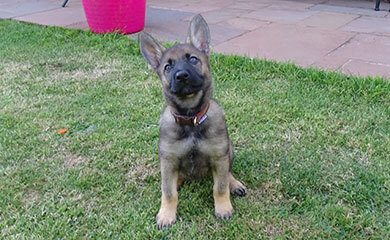 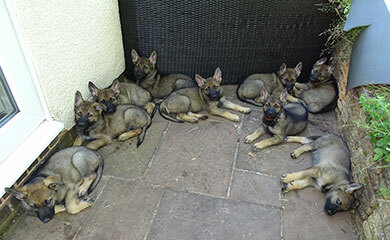 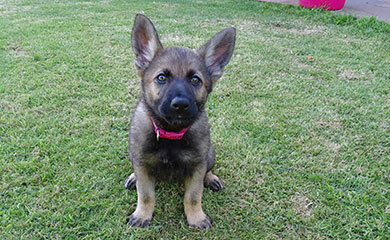 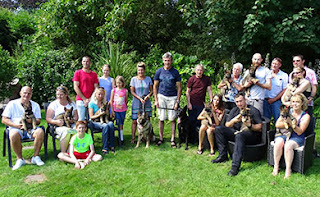 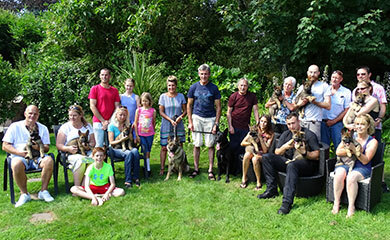 Last week the winners of our name the pups competition all came around to our house to name and meet the pups. Everyone had a great time and tired the pups out which takes some doing. 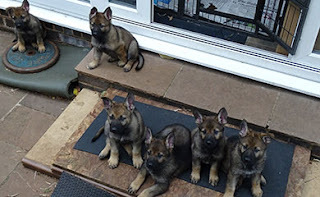 Here they all are with their new names. Two of the pups were already named. One of the pups we named was Donna who we have named in memory of our lovely puppy walker Donna Highton who sadly passed away this year. 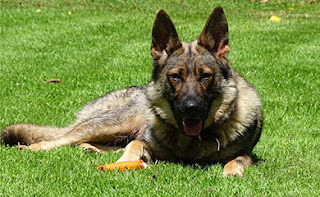 We all miss her and we did a special tribute to her in Blog 6 this year. 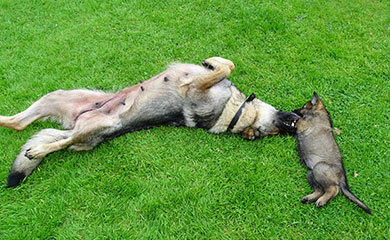 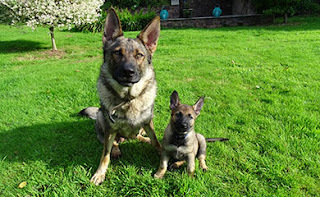 Here is pup Donna with mum Sasha. 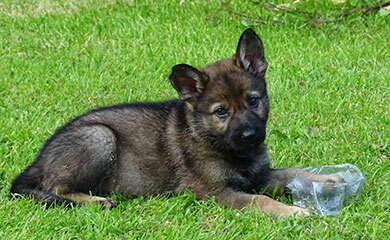 Pup Donna is without doubt the most disruptive and troublesome one in the group and I have no doubt that If Donna is looking down she will be enjoying watching her antics. Pup Donna is always in the thick of the action. You probably remember Donna was the pup who mum disciplined early on for answering her back. The other pup we had already named was Dot. We named her because she wasn’t putting on weight in the first 2 weeks and needed special one on one feeding sessions with mum. She has made up for it since and regularly wins the tug battles with her littermates. 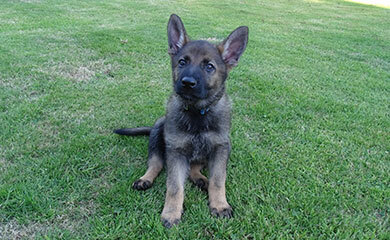 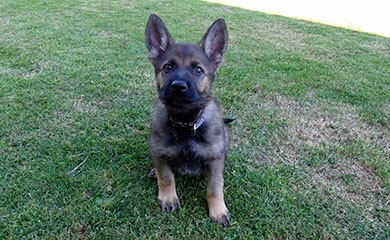 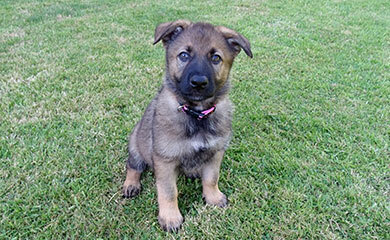 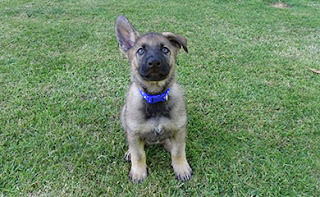 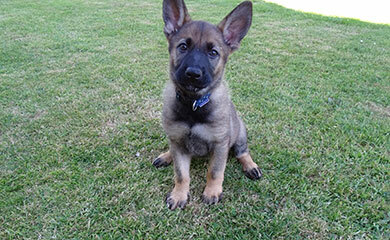 Last week I carried out assessments to identify the pups with the attributes we are looking for in future Police dogs. 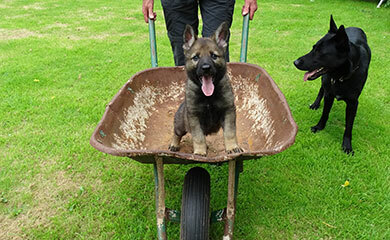 Dizzy is pictured here already showing a very confident attitude in a wobbly wheelbarrow. 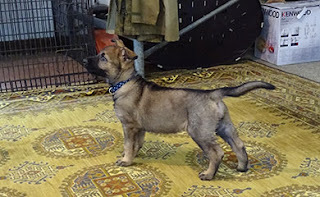 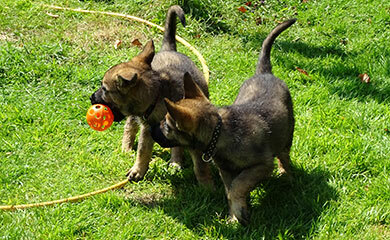 When we are assessing pups we look for the most playful, determined, and confident characters. Duke is showing a very determined attitude here holding on to a toy tug so hard I can lift him off the ground.. I had a very good idea from observing the pups over the last 2 weeks who the stand out pups were and the assessments pretty much mirrored what I had already decided. 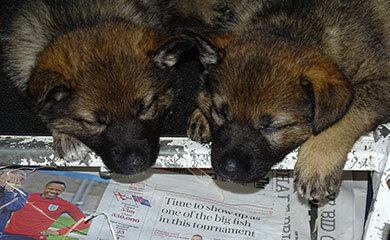 We also look for the pups who can cope with stress. 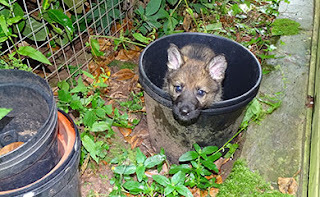 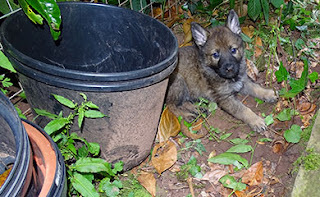 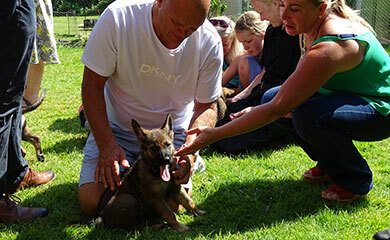 This is assessed by looking at the pups reaction to being placed on his/her own in a place they have never been before. 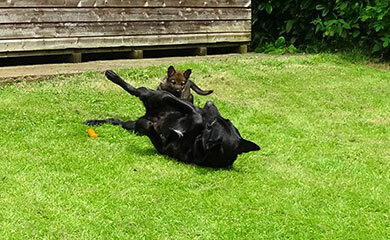 Donna is pictured here looking like she owns the place. 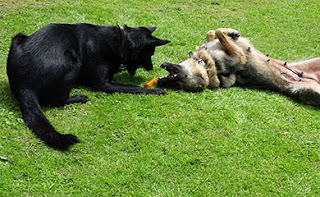 Because most of our training is reward and play based we look for very dogs with a very strong play drive. 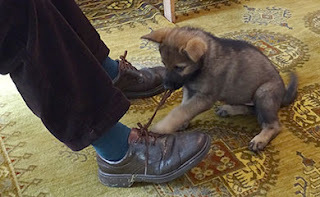 Darcy is showing here she doesn’t need a toy the assessors shoe lace will do. All of the pups did really well but because we only have a certain number of handlers needing new dogs we can only take 6 out of the 9 pups. 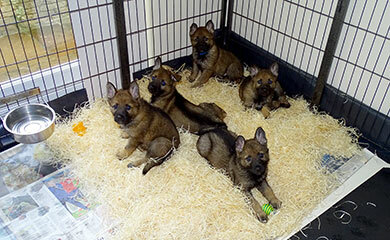 After 2 assessment sessions I selected Devon, Danno, Duke, Donna, Dizzy and Daisy. 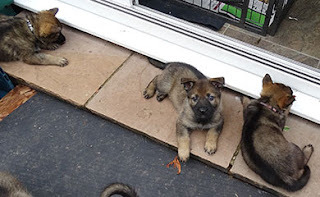 Dora, Darcy & Dot have gone to pet homes. This was hard for me because Devon, Donna, Dizzy were obvious to anyone watching them but I literally could have selected any 3 from the remaining 6 pups. The pups are all very alert and inquisitive reacting here to a noise in the garden. The week was extremely hot during the day and the pups spent a lot of time relaxing and seeking shade in the garden to stay cool. 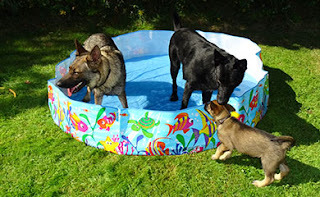 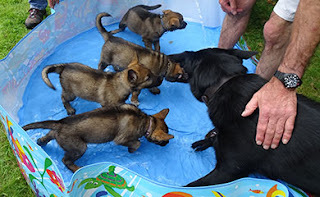 During the weekend I got the paddling pool out to help keep them cool. 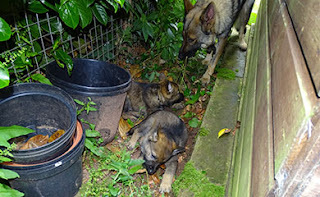 The pups tended to come alive in the early morning and late evening when it was cool. 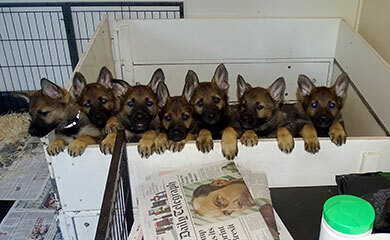 Here are 6 pups patiently waiting for lunch to arrive. and 3 others not so patient trying to get inside via a side door. 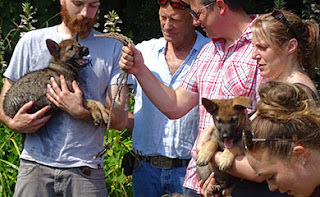 So before we knew it the final day had arrived when all of our puppy walkers and new owners came to the house to collect their pups. We had TV crews and media and a huge crowd of people. 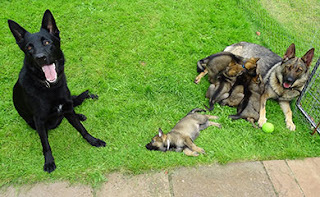 I had to open up an area which was new to the pups but the way they coped with this and the huge scrum was amazing. 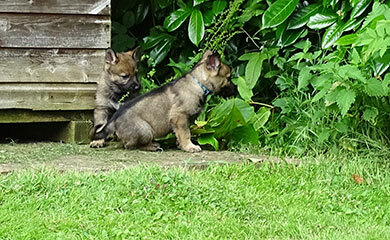 Sasha and Lenny were a little stressed to start with because the pups were running all over the place. 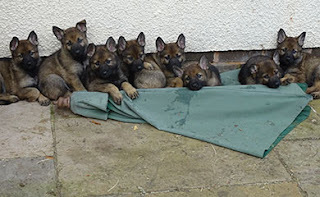 So that was it we had one final group photo of everyone before they all left to go to their new homes. I put Sasha and Lenny away while everyone had one last play with the pups before their journey home. 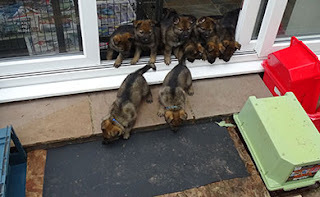 I then cleaned out the conservatory to get back to normality. 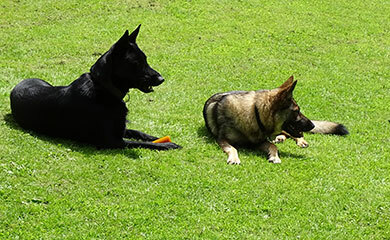 Sasha and Lenny are pictured here wondering where everyone has gone. I have contacted all the puppy walkers to see how their first night went. 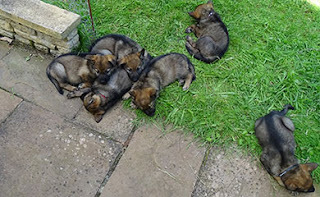 All did very well sleeping through most of the night. 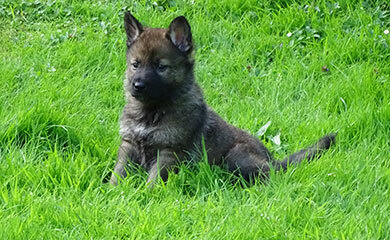 Over the next week I will visit them all and we will feature their development every 2 weeks. 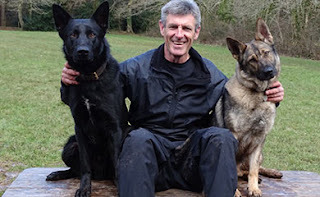 Finally I would like to thank everyone for their kind comments and support but most of all thanks to my wife Diane for putting up with all the upheaval and her hard work. 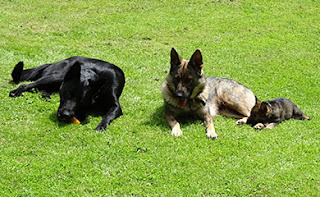 From Lenny Sasha and me see you next time. 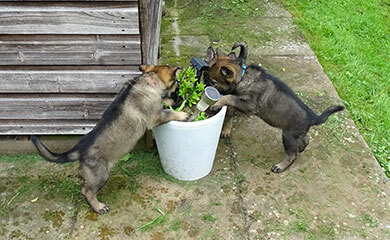 The pups are 6 weeks old today and they are really starting to explore the garden. I have cordoned off an area in the garden where they can roam to their hearts content and cannot come to any harm. you can see the pups coming out of their pen into the garden. 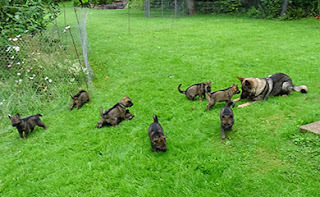 The second day was particularly windy but as you will see in Video 2 it didn’t seem to slow them up at all. 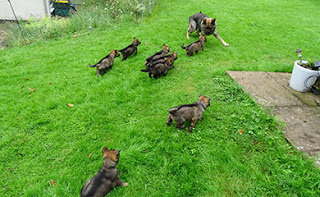 In fact some of them moved so fast I think the wind was blowing them along. 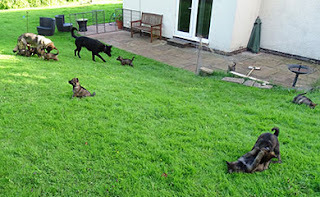 In the early days they tended to stay on the grassed area near to their Den. 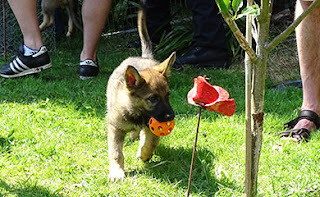 We are getting loads of visitors and the more the merrier to give the pups that all important socialisation. 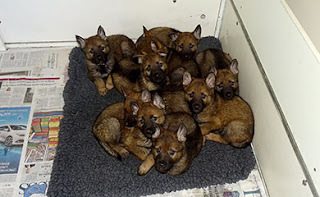 They are certainly getting used to being photographed. 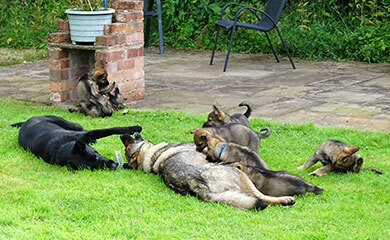 Sasha is completely accepting of visitors in with her pups. When she is there I do ask that people do not pick the pups up as she does get anxious if they do that. The pups became a little unruly for one of our guests. 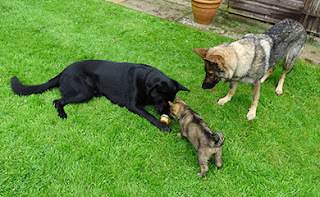 The boys asked if they could play with Sasha and I have such trust in her temperament I left them to it although watching from a distance as any responsible owner should always do. 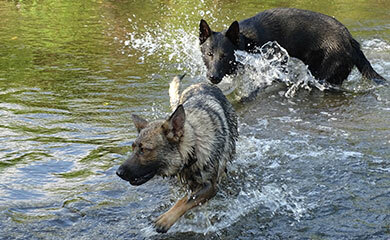 With the fine weather they practically live outside like wild dogs. They find all the sheltered areas out of the sun and sleep after their play sessions. 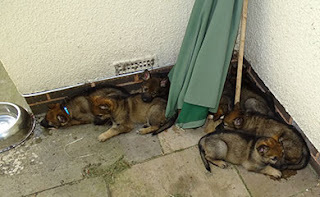 When the sun is out it is much more comfortable for them in shady areas outside than it is in the conservatory. 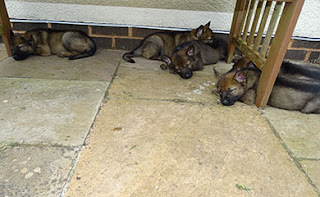 We had a particularly hot day over the weekend and the pups all crashed out on the tiled floor in the conservatory next to the open patio doors. 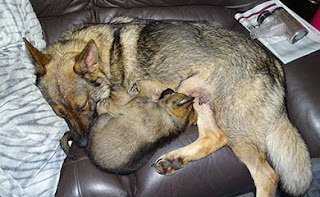 I didn’t have the heart to move them. 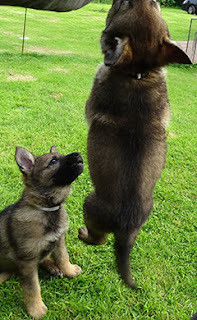 In addition to socialisation I also introduce them to all sorts of unusual and loud noises. 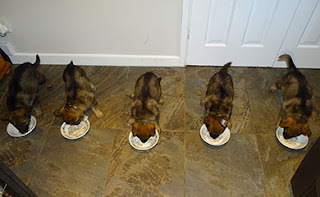 I do it just as they are about to have their meals when they are so crazy for their food nothing is going to get in the way of their grub. 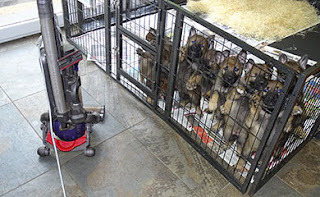 They are oblivious to the hoover which is quite loud alongside them. Their favourite meal of the day is their Weetabix and goats milk, they go absolutely wild for it. 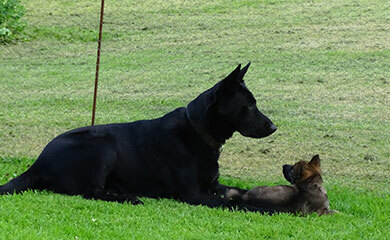 One of the things that has really pleased me has been Lenny’s complete acceptance of the pups. Here he is with his daughter Silver collar. 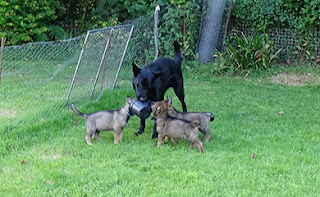 He loves interacting with the pups and assists Sasha with keeping them together and in order. 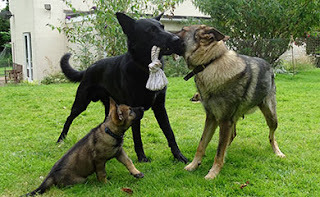 Very often the pups will try and take toys from both Lenny and Sasha and both of them communicate to the pups that they cannot have them without getting nasty or possessive. 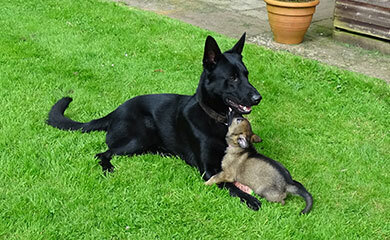 Both of them have such wonderful natures. 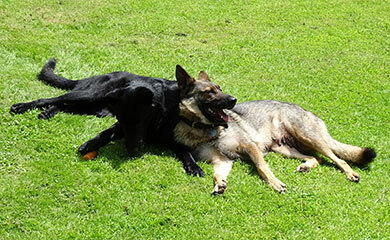 What I have also found very moving is the close relationship that Lenny clearly has with Sasha. They are always looking out for each other and love being with each other. I have always believed there is so much more to dogs than people realise and so much we do not know. 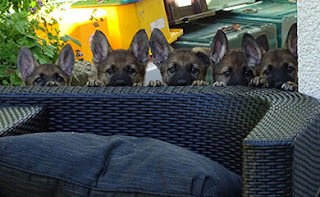 All the while they are looking and studying us trying to work us out. 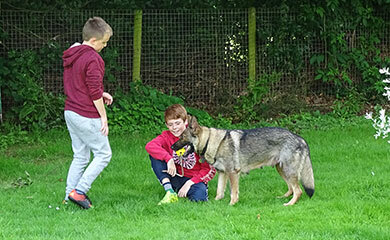 Too often a handler will blame the dog for a lack of performance never once considering their own performance or failure to communicate properly with their dog. 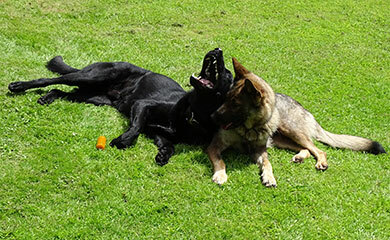 If a dog fully trusts you and loves every minute of being with you it is amazing what you can achieve together. This has definitely been the case since I have had Sasha. 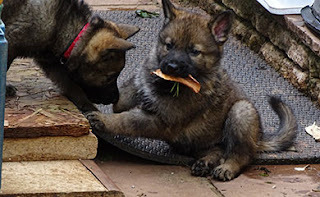 I introduced wood wool into the den this week because it is without doubt the best thing you can use in keeping the den clean. 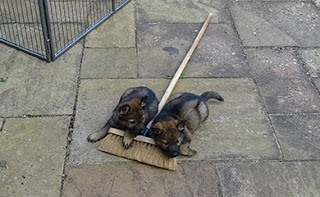 The dogs toilet on it and it all sinks to the bottom leaving the rest of the den clean and the pups smelling better for it. 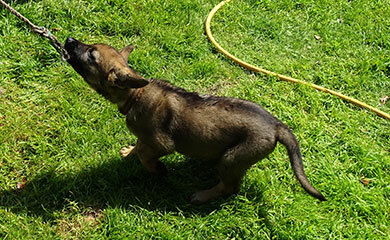 because she has answered her mother back several times. Mum didn’t allow it to go unanswered following her and repeatedly correcting her harder each time until she submitted and accepted her authority. 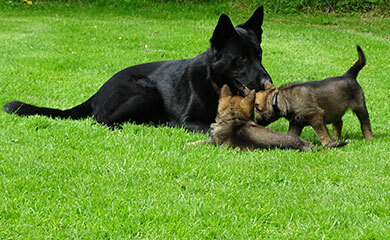 and watching them play and keep emerging and going back again is how I imagine pups would be in the wild. 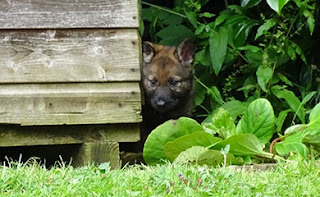 Here is one just peering out to see if anyone is about. 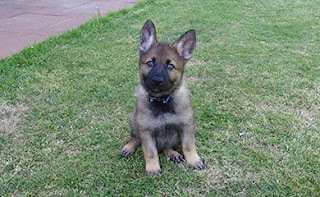 Here are 2 more Pics that I like. 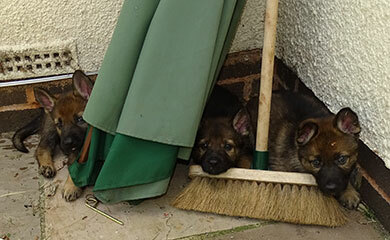 They have to remember though that Mum is never far away no matter where they hide. I have included a final video of the area where they now play and their Den at the back of the shed. I apologise for the poor light at the rear of the shed but I think you will get the picture. Here are a couple of my favourite pictures of Sasha interacting with her pups. 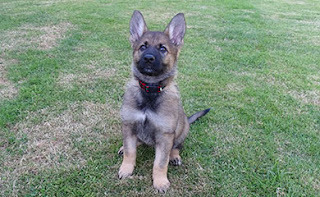 Finally to finish off here are a few random Pics. 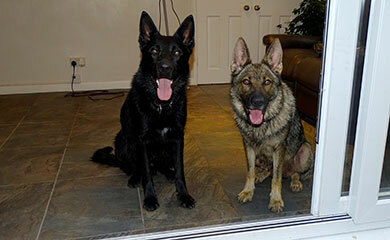 That's it from Lenny, Sasha and Me see you next week which will be week 7.